This is not a pretty topic, but it’s something not to be ignored: how to clean fresh fruits and vegetables. 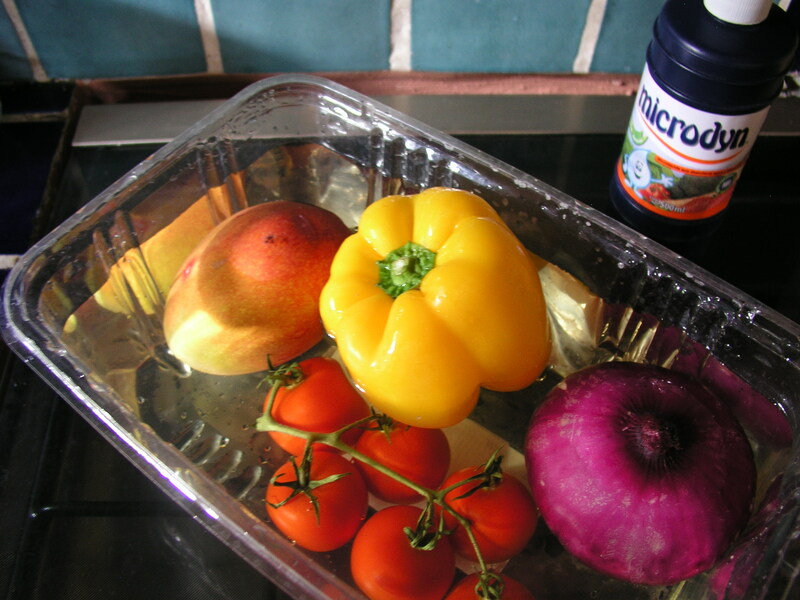 For those of us who live in Mexico, the practice of soaking all fresh produce in an antibacterial solution is necessary. 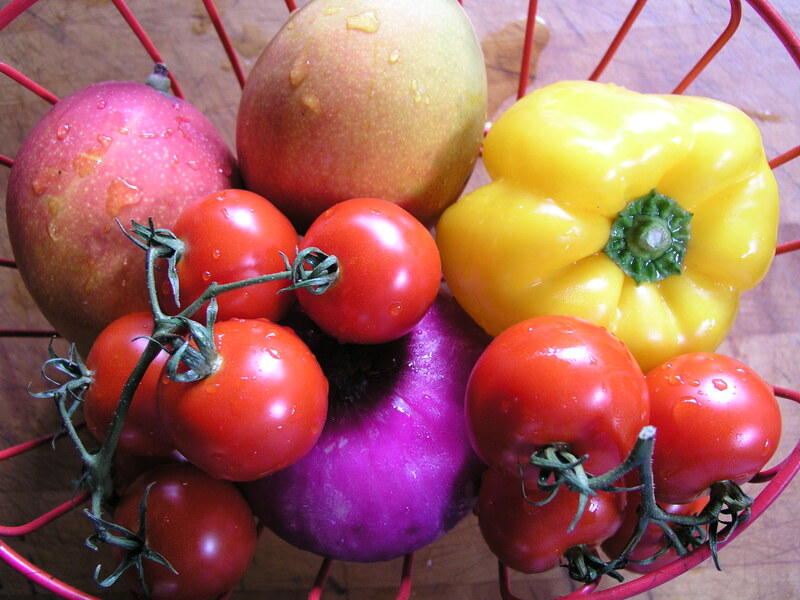 Soil, microbes and bacteria are found on the skins of fruits and vegetables. In Mexico (and other countries, including those north of the border), where sanitary practices are not always followed, from the time produce is grown and harvested, until it is delivered to the store, there are opportunities for contamination: unclean hands, waste water run-off, animal wastes, fertilizing with fresh manure, irrigating with unclean water. Washing fruits and vegetables in tap water, or even purified drinking water, is not sufficient if you want a sanitary kitchen producing healthy food. Tap water, no matter how pure, will not kill bacteria. Purified drinking water does not kill bacteria. Using an antibacterial product in a soak solution will ensure clean produce, whether it is to be eaten raw or cooked. Anything with a skin that you plan on removing before eating, like cantaloupes, watermelon, limes, and mangoes, should be soaked. Produce that grows close to the ground, like cilantro, especially needs to be soaked. Anything eaten raw needs to be soaked, whether it is peeled first or not. (Bacteria on the peel can be transferred to the peeled fruit by your hands or knife.) Any produce that will be cooked should be soaked, because it may not be cooked long enough to kill certain bacteria, or it may contaminate other, already cleaned produce (that will be eaten raw) if stored in contact with them. In short, everything fresh in the plant world that passes through your kitchen should be soaked in an antibacterial solution. This lesson was driven home to me a few years ago when I walked to our neighborhood store very early one morning. Produce was being unloaded from a truck and placed directly on the pavement. No plastic bags or newspaper or anything, were between the cilantro, lettuces and watermelons and the cobblestones. I will not go into details of the other substances I sometimes see on the same cobblestones, stuff I would never want to come into contact with anything edible, but the sight of this was enough to make me turn around and vow never to shop there again. Later, when I had time to think about this rationally, I realized that anything purchased in the cleanest supermarket may have spent some time on the ground or pavement on its way to the store. Or handled by unclean hands. Or other situations I don’t want to talk about here. So I did shop at this store again, but I am now extra careful about cleaning produce no matter where I purchase it. This is an easy practice if you make it part of your kitchen routine. Common products used in Mexico are Microdyn and Bacdyn, both of which contain the active ingredient ionized silver (which I do not believe is the same thing as colloidal silver, but I am not a chemist), and both are equally effective. They are usually sold in grocery stores in the produce department and come in different sized bottles. North of the border, grapefruit seed extract is used, as well as other commercial products. A solution of Clorox (sodium hypochlorite) and water is effective, but a rinse with potable water is needed, plus chlorine has environmental issues. Microdyn and Bacdyn solutions don’t need to be rinsed off, a plus if you live in Mexico or another country where drinking water is purchased. I use Microdyn, and have noticed that different sized bottles contain different concentrations. The largest bottles are not as concentrate as the smallest, so more Microdyn is needed. To soak: first wash off any obvious soil. Always read the instructions for the proportion of solution to water and how many minutes to soak. Various brands and different sizes of the same brand call for different amounts of concentration to water. Use tap water, not purified water, because the antibacterial product kills any bacteria in the water as well. After all, this is the same procedure for purifying unclean drinking water. After soaking for the specified time, place produce in a colander or on a clean dish towel to drain. You don’t need to rinse off the soak solution (unless you used chlorine bleach, and then only with pure water). Allow to air dry completely, as drier produce stays fresher longer in the fridge. If you elect to clean your fruits and vegetables with chlorine bleach, do not use scented chlorine or color-safe bleaches. The University of Nebraska, USA, suggests using 1 1/2 teaspoons bleach (5.25% sodium hypochlorite) in one gallon of water. Do not wash before storing. Rinse just before using. Clorox brand bleach contains 5.25% sodium hydrochlorite. Ohio State University, USA, instructs to soak produce for 15-20 minutes in a chlorine bleach solution. The amount of bleach to add to water depends on the percentage of chlorine it contains. For 2% chlorine, use 3/4 tablespoon per quart of water. For 4% chlorine, use 1 teaspoon per quart of water. For 6% chlorine, use 1/2 teaspoon per quart of water. Rinse thoroughly with safe drinking water. North of the border, a product called Fit is sold for cleaning produce. The makers claim it removes chemicals on the surface, but their web site offers no claims that it kills surface bacteria. Cleaning products that contain grapefruit seed extract are more effective, as GSE, as it is known, has been found to eliminate fungus and bacteria. (It is used in hospitals as a cleaning agent.) Look in health food stores and natural food stores for products containing grapefruit seed extract. Produce can also be cleaned with a solution of one cup of vinegar to three cups of water. Either spray fruits and vegetables with this solution, waiting three minutes before rinsing in clean water, or soak produce for three minutes and then rinse in water. Use a scrub brush to clean dirt in crevasses. Cross contamination is common. Unsoaked squash or broccoli are cut up for cooking in your kitchen. Then salad ingredients are prepared on the same cutting board, using the same knife. Cross contamination has just occurred. Even hands contribute to cross contamination. By soaking every fresh fruit and vegetable, you will join the practice of the majority of cooks and kitchens in Mexico. Disinfect all your produce as soon as you come home from shopping. Make it a policy to not put any uncleaned fruits and veggies in the fridge. This way, everything is ready to grab and eat, or cook, without stopping to clean and soak. And an unsuspecting family member will not reach for an uncleaned apple. The same disinfectant solution may be used many times over, provided the water appears clean and does not have dirt and spoiled plant parts accumulating. I normally prepare one container of Microdyn and water and re-use it until all the produce brought home from the market has been disinfected. This is on the advice of my husband, a former chemist, who says that ionized silver, the active ingredient in Microdyn and Bacdyn, does not break down or get “used up” with successive soakings. Be aware of cross contamination. Don’t allow unsoaked produce to be stored with clean. If you used a cutting board and knife to trim before soaking, wash them thoroughly with hot water and soap before prepping soaked veggies. Cilantro, tomatoes and other produce may have obvious soil or dried mud on the surface. Rinse off completely before using a soak solution. To clean tight heads of lettuce and cabbage, remove the outer leaves. The inner head is already clean, as it grew from the inside, protected by the outer leaves. If you buy a head of cabbage already cut in half, a common occurrence in Mexico, it will need to be soaked, as you have no way of knowing if the knife, hands and cutting board were properly cleaned first. Never buy watermelons or papayas that have already been halved at the store. Mushrooms and strawberries are too absorbent to soak in a solution without becoming water-logged. Walmart sells a spray to use on fruits and vegetables, and this is probably the best way to clean these two. The active ingredient is “citrus seed extract”. Spray and wait 10 minutes. For other spray products, follow the instructions. 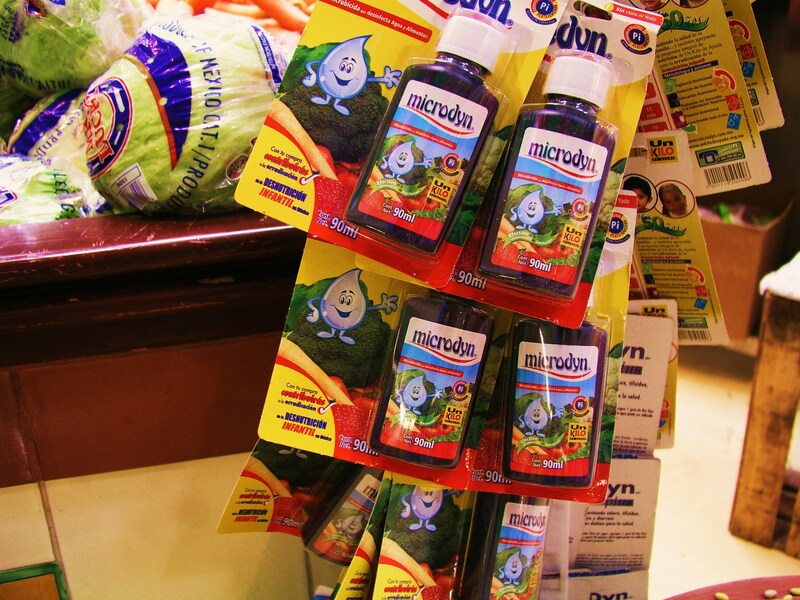 A special note for travelers: if you are on the road in Mexico, or anywhere, and want to disinfect the fruits and vegetables you purchase in the markets, travel with a zip lock bag and a small bottle of Microdyn, available in any grocery store, even in the smallest Mexican towns. Disinfect your produce in the zip lock bag first before eating. You do not have to use purified water, as the Microdyn disinfects water, also. In fact, Microdyn will disinfect drinking water if you are unsure of its purity, though these days, purified water can be purchased anywhere in Mexico. We also travel with a small cutting board, knife and vegetable peeler. Great tips! 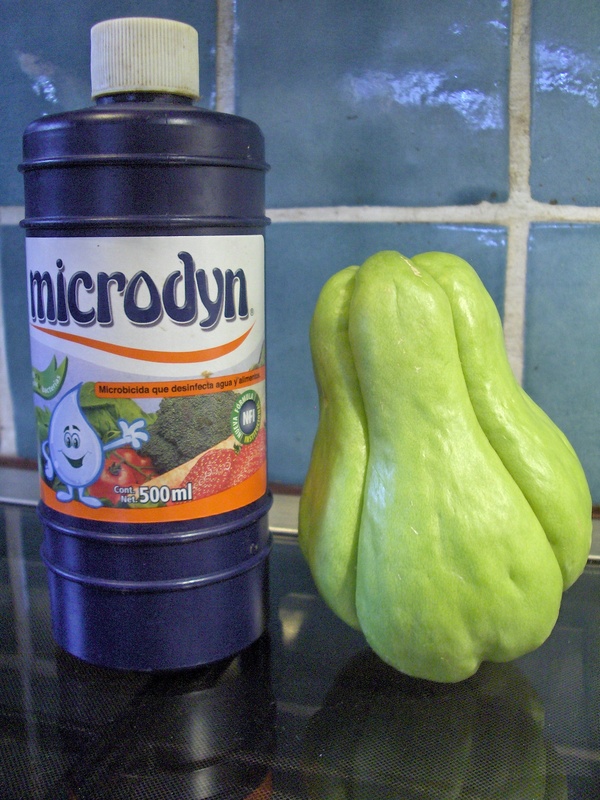 My wife and I recently moved to Cancun and bought Microdyn to wash our fruits and vegetables. To be honest we just recently bought it even though we’ve been here for over a month. Before that we were just washing and rinsing with soap and tap water to clean our produce. No illness yet. We’ll have to look into getting the spray options you mentioned for mushrooms and strawberries because washing each one individually with soap was a hassle! Glad the tips helped, Daniel. My current mushroom cleaning method is to brush detritus off of each one, then cook them. I never eat them raw. Soaking doesn’t seem to be a good way to treat strawberries. My present method is to briefly rinse them in the Microdyn solution, then drain, just as you would rinse them in fresh water. Let the Microdyn/water solution sit for 10 minutes first if you are using tap water to purify the solution. Thanks for this comment. I’ve added an update to cleaning mushrooms and strawberries to the main article. Hola! I’ve found this post very helpful since moving to MX recently, so thank you! Curious – do you use Microdyn to soak garlic or onions prior to using? I know you said to soak things with a peel, even if you don’t eat it – but I’m worried my garlic will be come soggy (or the whole head will need to be used right away) if I soak to disinfect. Glad you asked, Lindsey. No, I don’t soak garlic; I just peel it. Sometimes the onions in the market have already had their skins removed. In that case, I soak them. But if they still have their skins on, I remove the skins and don’t soak. Thanks for the question. Thank you for this information! I’ve always used one of the two products you mentioned to clean our produce whenever we come home from the store or market. Quick question for you: how would you suggest cleaning fresh herbs? Is it similar to the way you’d clean other fruits or veg? This year my husband and I decided to buy a few fresh herb plants for a herb garden in our yard. As I typically don’t cook with fresh herbs, I haven’t a clue how to go about cleaning them, although it’s clear that, living in Mexico City, we need to. Thank you for any suggestions you can offer. Good question. I clean herbs the same way, though I think cilantro loses some of its pungency and flavor after soaking. Don’t leave them in the soak solution longer than 10 min. I guess you’re using city water in Mexico City, and I don’t know what the quality of that water is. How wonderful to grow your own herbs — maximum freshness. Next, you can have a few potted tomato plants. What a wonderful post, you have put a lot of effort into this one, I can tell. Love everything about this, great post. Hope to see more such posts from you soon. Thanks, Joel! It continues to be the most popular post on my blog, with readers from all over the world. And we and our friends and neighbors here in Mexico are still using Microdyn and staying healthy. Yes, I’ve been here in Mexico 20 years now, hard to believe and used bleach for many years until a doctor told me I should be using Microdyne. We eat a lot of fruits and vegetables. We have had no problems and it cut my soaking time in half! According to research done at Univ Arizona – Microdyn did nothing to remove or kill E coli or Listeria from lettuce leaves. Only Fit and diluted bleach did. All I can say is that after 20 years of living in Mexico and using Microdyn on all vegetables and fruit, we have no stomach problems. It is probably the most widely used product to clean produce here in Mexico, and surely if it produced no sanitizing results, there would be a national health problem. Perhaps the microbes that were used in the test are not the common microbes found on produce in Mexico? Microdyn is used to purify water here also. There is a national health problem. In the state of Yucatan in the 1st 6motnhs of this year there were some 70,000 cases of food poisoning report to the secretary of state for health. These are the ones severe enough to go their doctor; how many more just pop to the corner shop and to buy a couple of tablet of Treda to treat themselves at home. Unfortunately there is not the institutional capacity at the moment to trace and identify the sources of the bugs nor the species involved. In the same vein we also need to consider the fact that the USDA have blacklisted the import of papayas from 4 farms here in Mexico. Why? Because their product is not fit for consumption and has killed one person in the US and made a whole lot more sick. You can read about it here: https://www.cdc.gov/salmonella/kiambu-07-17/index.html. These farms are not leaving their papayas to rot and they either export to other less vigilant countries or sell them locally. In our local supermarket the maradol papayas last month had had their stickers of origin removed. I wonder why? These issues of health with large scale food production are not confined to Mexico, but because the relevant institutions here do not often report clearly, or make clear public warnings about outbreaks of food borne diseases, then we often do not hear about such problems. Wow, I didn’t know this. Meanwhile, my husband and I eat papaya daily, as it is one of our favorite fruits. Many of the restaurants serve it on their breakfast fruit plates. Currently, my husband is hospitalized (it has nothing to do with his stomach or eating! ), and the hospital serves papaya with almost every meal. I’m sorry to hear about this outbreak. It underscores the need for proper produce handling and cleaning. where can I buy Fit products? Hi there, I’m so excited to find you! I was looking for info about Microdyn, and Yaayyyy! Found it. Hi Trina, sorry for the late reply — I have been away from my computer. My suggestion for buying beef that is not feedlot raised would be to find a small carnicería, maybe in a small, nearby town, and ask if they sell locally raised beef sin antibioticos, sin químicos. Most likely, the big supermercados are buying beef in big lots from feedlots. This has been our best way to buy range fed beef. It’s tougher, but tastier. We buy chicken from small stores, also, in small communities, asking for locally raised chicken. Does Torreon have a Costco? The Costco in Puerto Vallarta sells frozen, organic chicken. They are also the best source for a limited variety or organic produce. I hope your pot roast turned out well. Buen suerte! I have read many of these informative posts but not all. Does anyone have any knowledge of the effectiveness of Hydrogen Peroxide as a disinfectant on fruits and vegetables. It’s fairly common where I am in Mexico. Brian, use your search engine and Google “hydrogen peroxide vegetables”. You will find a lot of instructions. Nice to see your excelent promotion of good food handling practices. Your description of how to treat food is great and I would urge people here to use the same procedures to clean the packets of pre-packed raw and cooked meats and dairy items from the supers. Having seen how in some stores these are handled I no longer just put them straight in the fridge when I get home. Also your readers should take greater care with crops grown on the ground such as canteloups and celery and make they are well scrubbed as well as soaked. I would like to add a few comments about the disinfectants you use. Silver nitrate (Microdyn) is extremely toxic in the environment (https://www.ncbi.nlm.nih.gov/pubmed/21191880 and https://www.ncbi.nlm.nih.gov/pmc/articles/PMC3995725 ) and surprisingly not that effective against pathogenic bacterial strains commonly found on Mexican vegetables (https://www.ncbi.nlm.nih.gov/pubmed/17061512), including typhoid bacteria! GSE has never been adequately proven to be a good disinfectant, indeed in the only studies claiming such efficacy the result was due to contamination with a synthetic industrial biocide. It will not harm you but you are really just using water. Microbial roulette! Thank you for the information you provided. It sounds discouraging, though, like a case of “damned if you do and damned if you don’t”, regardless of which cleansing method one uses. My understanding is that chlorox is not good for the environment, either. The information you gave will help readers make their own choice. As we have used Microdyn for the last 18 years of living in Mexico with good results, I will continue to use it. Don´t be discouraged: you are only damned if you don’t! The risk to you personally is a illness, and this risk reduces as soon as you give the food a good wash, and even further if you use some disinfectant. The risk reduction depends on your preferred disinfection. Your article is very clear and thorough on this. The only consideration then is if you worry about the environment. All biocides (disinfectants) kill. They have to in order to work. But we need to co have already created silver resistant bacteria, species that cause illness and live in Mexico on crops. This is an environmental impact. We also know silver kills aquatic organisms. Your are right that Clorox in industrial amounts (for bleaching paper and cotton) has a big environmental impact, but the small amount in solution for food cleaning is destroyed in seconds as soon as it gets to your sewage system. Thank you for your perspective. We should all have environmental concerns, and act upon them. Doc, I’d like to hear what you’ve found out about using vinegar for disinfecting. That would certainly be the cheapest and easiest way and most environmentally friendly…if it’s effective. Apparently, a vinegar solution removes 98% of bacteria. That sounds good until I wonder what’s in the remaining 2%. I don’t know if Microdyn is any better. I’d read that NPR report, and have also read some medical papers on the subject, although I haven’t found the one mentioned in the report. The 98% kill is for 2 minutes of soaking. I’m soaking most vegetables (after I wash/brush them off) for 10 minutes, with lettuce as the exception since any leftover red leaf lettuce seems to start rotting quicker (even in the frig) if I leave it too long in the vinegar. So I’m trying to keep the lettuce to the 2-3 minute mark. I’m glad you mentioned the NPR report, I’m trying to locate the medical papers I had read so I can read them again and just confirm all this. BTW, if you cut tomatoes in half and then soak them in pure vinegar for a few minutes(before you add them to a salad), it gives them an extra zing. That helps a lot since most store bought tomatoes (even the organic ones I buy) aren’t ripe and don’t have much taste. Hmmm…interesting about the tomatoes. You’re right, they can taste kind of flat. I’ll try the vinegar “marinade”. Doc, In reading the study you referenced, I see that their use of vinegar is in a 10% solution whereas the solution I’ve read about most, and use, is a 25% solution. That may explain the difference between the 90% kill from this study, and the 98% kill in other studies. And since I usually soak my produce for 10 minutes instead of 2, I wonder how much that extra time raises the kill %. For your acidified Clorox soak, are you using off the shelf Clorox? And how much do you add to a gallon of acidified (6 tsp vinegar) water to obtain the 200 ppm level. Also, is there any aftertaste on the produce after rinsing it after this soak? It is a little hard to make direct comparisons between studies when the test bugs are different, the fruit or vegetables are different, the temperature and concentrations are different. In this study the solution they used was 43oC, which is quite warm. We do all our cleaning in cold water. But I bet you are right that a 25% solution will be better than 10%. The Clorox we use is off the shelf and is marked fit for use to clean food and we use a homemade measuring cupful in 5 litres with 6 caps (of the bottle) of vinegar. Sorry I cannot find the volume calculations I did to make the cup, though I guess it is about 2 teaspoons. I tested the vinegar pH effect with test strips on our Yucatan well-water. When we moved to the Philippines nearly 3 years ago I did extensive research on disinfecting food. I found the most effective to bleach. It kills both bacteria & viruses (vinegar is not effective on viruses unless heated, but I didn’t want heated tomatoes, etc.). My big concern is with nematodes, those nasty parasite eggs. From all my research I learned that only chlorine killed them. It was also interesting to read the effectiveness on different kinds of produce. All the studies I read said that lettuce & cabbage, because of their wrinkled surfaces, could not be adequately disinfected. Air bubbles form in many of the “nooks & crannies” and prevent the disinfecting solution from contacting those areas. Results from using chlorine bleach: No digestive problems. No parasite problems. This is dramatically different from when I lived here before & knew nothing about disinfecting produce & eggs. Back then I had frequent diarrhea and was twice diagnosed & treated for amoeba. This time I avoided lettuce & raw cabbage. I used 2 tsp. bleach per liter of filtered water and soaked for one minute. Another observation: thinking that produce is safe because it wasn’t grown near (or down stream) from farm animals is an error. Manure from farm animals is transported & used on crops everywhere. In many countries night soil is also used. That is called “organic” and it may produce food free from chemicals, but it presents other issues that can be just as harmful. Thank you for your contribution to our ongoing conversation. We are all learning from these recent comments. I’m grateful to all the readers who care enough to take the time to share their research and experiences. Thank you for your detailed post! Is it necessary to disinfect utensils and plates in Mexico? The tap water is unfiltered at our home. We have the drinking water spout which is pumped from the giant bottles but I try and save this water only for drinking and rinsing veggies prior to disinfecting. Does the bacteria from the tap water remain after the dishes dry? Or, is there a disinfecting routine that you use here? Thanks! It is not necessary to disinfect dishes or cutlery, but they must be completely dry before use. Nor is it necessary to use drinking water to rinse produce prior to disinfecting. This is a waste of purified water, because the disinfectant will disinfect the veggies, including residual water on their surfaces. I hope you are using tap water for disinfecting veggies. Your disinfectant solution disinfects water. and the products aren’t always easy to find whereas vinegar is about as ubiquitous as anything could be. The soaking times I’ve read about are 2-3 minutes, and I usually let things soak for 10 minutes or more, and shifting the items around occasionally …especially things that float like tomatoes. I check the pH with test strips and as long as it’s pH4-5 I don’t worry about it and re-use it as long as it doesn’t get too cloudy or dirty. I keep a mix in a 1 gallon jug and I add fresh vinegar regularly to replace that spilled. Hi John, sorry for the late reply. We have moved to a remote place with no internet connection. About vinegar — I’m primarily writing to address sanitation issues in Mexico. Food borne illnesses, amoebas, sometimes questionable water irrigation practices, are all concerns here. 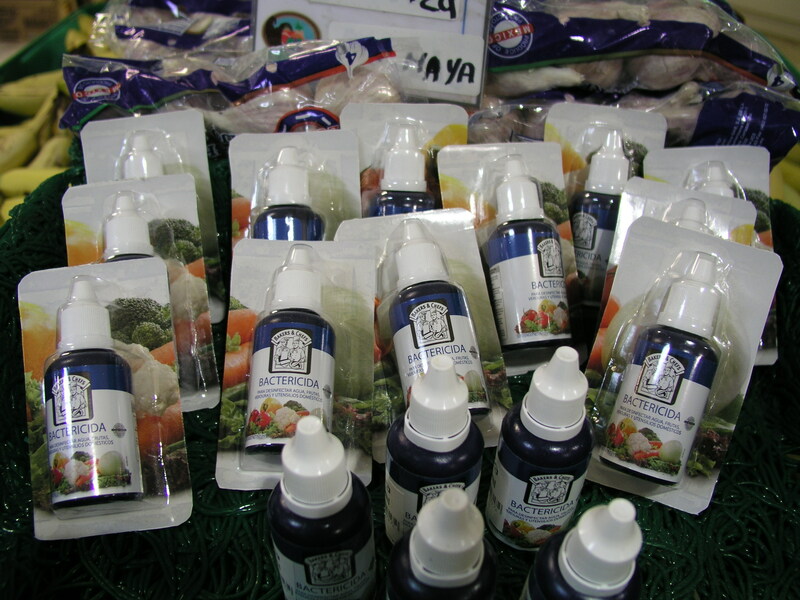 Microdyne is a common solution to achieving safe, fresh produce in Mexico. I don’t know if vinegar is as effective for Mexico’s (and other developing countries’) particular food challenges. Microdyne is relatively inexpensive — we’re probably talking pennies — or pesos — per use. I would need to do more internet research on vinegar’s effectiveness, and right now I don’t have the internet time. I invite you to research this with Google, and let us know what you find. I hope you share your info with us. Hi, I’m from Mexico and found your post trying to find out a way to desinfect my vegetables in the US, I use mycrodin all the time but I can’t find it here! While reading your post I wonder 1. Do you think vegetables in the US do not need to be desinfected? 2. What can I use to clean my veggies if I can’t find mycrodin? Thank you! Hi Valeria, sorry for the late reply; I don’t have internet connection at our house. There are commercially available products at stores like Whole Foods. As I don’t live in the US, I’m not familiar with brand names to recommend. You can also use a search engine, like Google, and get recipes for disinfectants using vinegar or Chlorox. Just found your blog today when looking for ways to clean fruits and veggies in Mexico. We are renting an apartment in Mexico City in February and are looking forward to cooking and eating some great local products—but that raised the question of cleaning. This post was really helpful and now we have something to follow. I was wondering, however, about lettuce in bags sold in grocery stores. It sounds like you trust when they say “washed and ready to eat”. Is this because they are prepared in a facility that is required to use certain water standards? Also, I was looking forward to fresh salsa. Can you advise about buying salsa as it sounds like you don’t order it in restaurants? Is is safe to buy in grocery stores? Do most restaurants use safe water to prepare their food, as well? thanks for your help. I guess I’m fairly trusting. If it says washed and ready to eat, I don’t clean it. We are buying washed salad greens at Costco, and I trust their practices. That said, this is still an individual decision. My experience is problem-free. I do not buy fresh salsa. It is easy to make. Yes, most restaurants use purified water, easily available and cheap. Restaurants don’t want to sicken and lose their customers. That being said (I’m repeating myself :), look things over and see if it looks alright. I never go back to a restaurant that has a funky bathroom. If they can’t keep the bathroom clean, they have lost my confidence in other matters. Look for the book, Eat Mexico, by Lesly Tellez, a blogger who used to live in Mexico City. Enjoy your stay! If you go into a restaurant that has salsas already sitting out on the tables, especially in the summertime, make sure you smell them. If they smell the least bit off, do not eat them. I got sick many times from salsas the first year I lived down here; I was trusting. Later, I finally caught on to smelling them. I think some of the restaurants didn’t keep them refrigerated properly or mixed fresh with older salsa. If we got sick from a restaurant we didn’t return to it. The bathroom observance sounds like a good test! I’ll have to agree with that too! Good advice, Angie. I have seen salsas with a film of small bubbles on the surface, they have been at room temperature so long. Even cooked salsas can fail the bubble and smell test. Your site is very interesting and informative. Thank you for all that invaluable information. At present I am in Mexico and have been following your advice for disinfecting fruits and vegetables. However, I am wondering about using tap water for cooking – like making sauces or stewing, making coffee etc. Should I be using the bottled water for those things? Hello Pru. I use bottled water for all the things you mentioned. It is relatively inexpensive and does not contain chlorine or other chemicals found in treated tap water. Thank you for your reply. I am relieved. In Mexico when I make coffee, I use bottled water. But then, I use bottled water to make coffee in the US because the coffee tastes better. If In Mexico, if I am going to steam veggies, I soak them in Microdyne and then use bottled water to steam them. If I am going to make a soup or something that will boil 20 minutes or longer, I use tap water. However, I just checked and the CDC – CENTER FOR DISEASES AND CONTROL – says that boiling water at a rolling boil for 1 minute kills MOST viruses, bacteria such as salmonela and e.coli, protozoa such as giardia intestinalis, et al. Here’s the link: http://www.cdc.gov/healthywater/drinking/travel/backcountry_water_treatment.html. Thanks for sharing this with us, Andrea. All info is helpful. My problem with using tap water in Mexico is that there may not be good oversight concerning the chemicals added to treat municipal water. Some days, I’m aware of a chemical odor from the shower water. My husband, a former chemist, recognized the smell and told me it is a chemical often used instead of chlorine (because it’s cheaper than chlorine) to treat water, and he suspects they are being heavy handed in its use. Bottled water in Mexico can be as cheap as 16 pesos for 5 gallons. This is about 20-some cents a gallon, so it really doesn’t cost that much to make soup with bottled water. I guess I’m just a stickler for not ingesting chemicals if there is an alternative. Since your response to my query I have been using bottled water for all my cooking, and I feel more secure, although earlier on I contracted something and had a couple days indoors. May have been lettuce that I bought from the organic market that I may not have washed carefully enough. It is quite a job cleaning and disinfecting all fruits and vegetables, waiting for them to dry before putting away. It’s an all morning activity. But I must say that once done, its convenient not having to worry about cleanliness after. Pru, I buy pre-washed organic lettuce at Costco. I guess it’s trust on my part, but I don’t wash the lettuce again and we have no problems with it. For cabbage, I remove the outer leaves, and do not soak it. For everything else, I fill a one-gallon tub with microdyne/water solution with veggies and fruits and set the timer for 10 minutes. Every ten minutes I take out the soaked produce, shake excess water off, and set on layers of clean dish towels to dry. Much of my kitchen counter is used for this, but it’s a good way to let everything air dry, even if I don’t refrigerate some of it until the next day. Greens like cilantro and other herbs are rolled in towels and refrigerated the same day. It’s an efficient system that is easy to manage. Hi, thank you for your thorough information about the desinfection. We are staying in Angola at the moment and I have been advised to desinfect our vegetables en fruits too. Unfortunately they dont really have ready to use products over here. What would you advise to use, are there any home made solutions? Hi Agnes, are you able to buy bleach? If so, read this this on Modern Survival Blog. If you can’t find bleach, let me know and I’ll help with online research. Have you asked your neighbors/local people how they treat produce? Thank you for your reply. Unfortunately forgot to raise the question last time we saw some friends, but will definitely do the next time we see them. Have been looking around in some supermarkets here, every shop has their own products. I haven.t found plain bleach, they are all scented with perfumes. I´m not sure if that is possible? Agnes, your best option is to try to find unscented bleach if no disinfecting products are available. Since it is widely used for purifying water, it is most likely available. Don’t use scented bleach. And ask your neighbors what they use. Please let me know what you find. Hi! So I finally found the bleach, I will try this first. I have asked my friends and they use either bleach or special disinfectant, it just depends on what is available. Unfortunately not everything is available all of the time here in Angola, but still I love being here. Thank you again for your help. I’m glad you found unscented bleach, and that there is a disinfectant product available. When we first moved to Mexico, it took a while for us to “learn the ropes”. With time, you will become a pro on everything you need to know about living in your new home country. It’s great that you love being in Angola, a real adventure I’m sure! Have you ever tried Oxine as a sanitizing agent? It is FDA approved and it is better than bleach. I add it to my chicken water containers to keep algae from growing. It can be used to wash fruits and vegetables, cooking utensils and the like. It leaves no residue and it does not need to be rinsed off before consuming or using utensils. It can even be added to dirty water to sanitize it before drinking. It can also be added to citric acid to cause it to free up chlorine and it gets very powerful (not something to do in an enclosed environment). It is heavily used in the brewing and poultry industry to wash down everything to sanitize it. It cost about $25.00 per gallon. A gallon will go a long way. I have not tried Oxine. Is it available in Mexico? It sounds like you may know more about drinking water than I do. It is a subject I have not researched. We buy Santorini bottled water, which is bottled by the Pepsi company. Ciel is bottled by Coca Cola. Both of these companies require very pure water for making their soft drinks, so I would trust these two before others. I like the taste of Santorini over Ciel. Their literature says they add some minerals back to the water (after they have distilled all the minerals out) to give it a pleasant flavor and return certain trace minerals. They use a UV (ultra violet) purification process, reverse osmosis, as well as other filters. My husband remembers this info from a brochure Santorini gave us years ago. My husband is a former chemist who owned a lab in Sonoma CA that analyzed water. My husband suggests you read about reverse osmosis. When we next purchase bottles of Santorini water, I will ask if they still have any brochures about their purification process. They gave us a brochure years ago when they started selling in our area, but I did not keep it. Last year I asked the delivery guy about the quality of the plastic bottles, and he said they were of a high quality, for what that’s worth. Santorini and Ciel are more expensive than some of the trucks going through town, but you are paying for a higher quality of water. Thank you for this very helpful info. Does Microdyne or Bacdyne leave any taste on the produce (or drinking water)? if so, is it unpleasant? It leaves no taste on vegetables and fruits. I have not used it to purify water, as we buy purified water, so I don’t know if it leaves a taste. I doubt it, because so little is used. Amy, I wish I knew the manufacturer. I’ve tried emailing the vendor (www.bulksupplements.com) but so far they’re not answering. I’ll try calling them next. Shortly after reading this article I ordered a package (250 grams) of pure GSE powder. But I don’t know how to mix or use it for disinfecting food, especially lettuce. I’d like to take one gallon of water and add the necessary amount of this GSE powder. I need to find out how much to add, and how long I would need to soak food items in it. Another unknown is if a mixed batch could be re-used or should be thrown out after each use. I’ve seen one reference to this in an older comment, but it concerns what must be premixed GSE and only mentions the number of drops needed. I’m starting out with the pure powder so I’d like to find out how to mix it. Any ideas? John, I don’t have any experience with gse powder, nor could I find any directions online for using itit it as a disinfectant. I suggest you contact the manufacturer. I never buy those expensive washing products. You can achieve the same results (at minimal cost) by using vinegar with water. Most cooks use that as it is much less expensive than those commercial products. I was wondering what fruits would be OK to buy at supermarkets in Mexico and which ones not to buy because you cannot soak them properly? Thanks. There isn’t anything I don’t buy, but I’m careful with mushrooms and strawberries, because they are absorbant. I brush obvious soil off of mushrooms and don’t soak them at all. Instead, I always serve them cooked, not raw. For strawberries, I look for really clean berries, and I do soak them. Lately, I have only been soaking them briefly — a few minutes, then draining them in a colander for about 10 minutes. They stay wet, so I reason that the microdyne solution stays active on their surface for that period of time. I know this is not based on science, but we eat them raw on cereal without any problem. I have treated fresh raspberries the same way. Thank you for this really great information. As a vegan, I will be eating nothing but plants–so this information is super useful, and something I probably would have had to figure out the hard way! I’m glad you find this helpful. Enjoy the cornucopia of fruits and vegetables in Mexico! I am moving to haiti in August. I am very nervous about how to clean foods properly as I DO NOT want my three kids, husband or myself infected with anything. I can certainly bring this product with me im sure… is this the best method? To answer your question as to which is the best method. If instructions are followed and the procedure is done correctly, either using a Microdyn type product or use of chlorine bleach, both will disinfect produce properly. I would feel confident using either method. Thank you so much for this great info (and shared it on my fb page!). I came into your site by ecosia search engine because I wanted to know how many drops of microdyn I needed on a gallon. Was not able to read the small letters on the bottle, not even with a magnifying glass lol. Glad you found Cooking in Mexico. When computing how many drops to add to water, it’s a good idea to still read the instructions. I know what you mean — the product info is sometimes impossible to read without a magnifying glass. But the different sized bottles of microdyn come in different strengths. The smaller the container, the stronger it is, hence, you use less. Thank you for sharing the info on your Facebook page. I checked out your page — you are in a beautiful part of Mexico. Have fun! If you buy bagged lettuce from the grocery store do you rewash them for extra caution or do you just believe it was soaked & is safe to eat? If the bag says something like “washed and ready to eat”, I trust that it has been properly cleaned. If there are no words to this effect, I wash the contents. So once I disinfect my fruits with Microdyn or the like can I just take the fruit with me to work in a ziplock bag or box & eat it later safely. How about my hands? Washing them with soap is enough or using disinfectant hand santilizer solutions? Once your fruit is disinfected, you can take it in whatever clean container you like and eat it safely. Of course we want clean hands when eating. Either soap or a hand sanitizer will do the job. You may have answered this question already, I am running out of internet time when I found your site and haven’t been able to read all comments. You talk about anti bacterial action of the produce cleaning solutions. I live in a third world country where it isn’t just bacteria, there are viruses and parasite eggs that contaminate food. Does Microdyn and Bacdyn have anti viral and anti protozoa properties? I don’t know the answer to this, Nancy. Perhaps you could contact Microdyn or Bacdyn to ask them. If you get an answer, please post it here. Thank you. You might also try some Expat sites. Sites for U.S.business people working and living in foreign countries. Nancy, Have you tried U.S. government sites for food preparation, for people traveling abroad? Is there a U.S. Embassy where you live? Or even if you knew someone in the Military. Years ago the military was taught how to prepare and cook certain things as a matter of survival during combat. Thank for the site!! I love it. I’m an American living in Mexico. I just decided to become a vegetarian, and your comments were super helpful. However, can you explain how to clean cabbage more? I don’t understand if i soak the head, how will i know when it dries? or do i break apart all the leaves and then soak individual pieces? or do i only have to remove the outer leaves and it’s ok? I don’t soak cabbage in a cleansing solution. My understanding is that cabbage leaves form from the inside, so the inner leaves are never exposed. For this reason, I remove the outer leaves and cut off the stem. I don’t have any science to back this up — this is just what has worked for me. I have done this for years without any adverse effects. Thanks for outlining the cleaning procedure. Takie care and Merry Christmas to you and all! You are very welcome. I hope you find it helpful. And Merry Christmas to you, too! Sorry, my post (#51) was incomplete. Common white vinegar will remove pesticides and wax and colorants from fruits and produce. It’s also vey, very cheap to purchase. I’m not entirely sure if they use wax or colorants in Mexico as they they do in the U.S., though. But, dangerous pestices, you can bet on it. Either way, they can still use pesticides down here that have been outlawed in other countries and the organic industry is not at all well developed in Mexico as it is in the US and Japan, for example. What I have been doing is mixing together several components in a bowl then throwing in the fruit or produce in there and leaving it completely soaked for about 15 minutes. Maybe more time might be better. ….Haven’t found any ideal or exact percentage yet of each ingredient but, I just use a pretty good splash of white vinegar as well as hydrogen peroxide and lastly, throw in the baking soda. By the way, baking soda is also very cheap to acquire. I think I’m mixing in about 5-6 tablespoons of baking soda into the mixture. Anyhow, it all comes up to a “boil”, bubbles and all, literally. ….But, try your own percentages in the mixture, or maybe the rinse should be applied in stages. First soak the produce/fruit in water and baking soda and hydrogen peroxide for 15-20 minutes then, rinse. Finally, make another rinse with water and white vinegar and let it sit there or maybe, scrub the produce or fruit with this and rinse. …….I guess I need to try this too even, if it takes longer and is more of a fuss. If you have another solution then maybe you can let us all now. …..Hmmmm, on another note, I’ve tried twice to get fresh spinach to last longer in the fridge. They were going limp in about a day or two and so far, after two tries, I got it to last like new, three days this week. The spinach that comes in a bag apparently lasts from 3 to 5 days but, the leaves have the stems cut off. I pretty much like spinach with the entire stem, but, they are harder to keep fresh in the fridge. Anyways, perhaps this should be left for another thread. Thank you for your comment detailing your procedure for cleaning fresh produce. Here are instructions from eHow on how to use the same cleansing ingredients. As to keeping spinach fresh longer (or any other fresh produce), it is important that they are dry, not damp or wet, to prolong freshness. Air circulation also helps. Perhaps you have noticed that some fresh veggies now come in plastic bags that have holes perforated in the plastic to allow for air. 1. Get out a large, plastic dish pan reserved only for washing fruits and vegetables. If you don’t have one, a large bowl would do. 2. Add enough cool or cold water to cover the vegetables you will be washing. 3. You can choose to use apple cider vinegar (such as Heinz or Bragg’s), or baking soda (such as Arm & Hammer). If you are using apple cider vinegar, pour in about 3 tablespoons per gallon of water. If you decide to use baking soda, sprinkle about 3 tablespoons to the water. Another great way to clean your vegetables, is to add your apple cider vinegar to the water, then pour in a couple of tablespoons of hydrogen peroxide (the inexpensive kind you see at the drugstore). This combination will really get your vegetables squeaky clean. 4. Add your vegetables and let them soak for about 5 to 10 minutes. Make sure you previously added enough water to cover the vegetables. 5. Use a vegetable brush to scrub the dirt from vegetables with skin, such as potatoes, turnips, or carrots. Celery can be very dirty as bugs and dirt are trapped and hidden in the celery ribs. A vegetable brush will easily clean it. Vegetable brushes can be found at your local dollar store or grocery store. 6. After washing, rinse your vegetables. [Be sure to use pure water.] Your fresh vegetables are now clean and ready to be prepared for eating. This information is perfect as my wife and I are planning to retire to Mexico soon. Washing and storing quantities of Mexican fruits/vegetables as per ‘for home’ will be new for us and is something we are actively gathering information about. However – not newbies to traveling in Mexico… my thoughts turn to all the times we’ve walked up to one of the multitude of lunch stands. Both fairly permanent looking structures and very mobile. Have we been doing something wrong or is there a way to do this more safely? This a part of Mexican life I love and really don’t want to leave it out of our future experiences. “Are the vegetables disinfected?”, they may respond yes, when that is not the case. I have learned not to ask a question where the answer can be yes or no, because it will invariably be yes, given the proclivity for wanting to please. Vendors are savvy and they want repeat customers. They want you back, not sick. Plus, most Mexicans are following the same disinfecting practices at home. The bottles on display in the produce section of supermarkets are’t there just for us gringos. I can say that we don’t shy away from street food, and we have not regretted it. Enjoy your retirement in Mexico when that day comes! ……….That will kill the germs but for the pesticides present on them use hydrogen peroxide (agua oxigenada) which is very cheap. It’s about 7 or 8 pesos (less than a dollar) for a good size bottle. Mix one part with 3 or 4 parts water in a large bowl and leave the produce in there for a few minutes, then, rinse off. Is there anybody else here who has tried this approach? Thank you for giving us the proportions for using hydrogen peroxide. I have not been able to document that it is effective in removing pesticides, though it is effective for removing contaminants and germs. The best way that I know of to remove surface pesticides is to peel the fruit or vegetable. Of course, this is not possible for everything, nor does it remove pesticides that have been absorbed by the fruit or vegetable’s edible part. I recently moved to Guatemala and have been using microdyn with great success. I had wondered if you could reuse the soaking solution, but as a precaution I always changed it out. It’s good to know I don’t need to do that–it will save me a lot of money! Yesterday I decided to buy seeds, nuts, and beans at the market. Do you know anything about disinfecting these? There is no reason to disinfect beans, as you should be rinsing them first to remove dust and debris, and then thoroughly cooking them. Seeds and nuts… hmmm, I have not considered disinfecting these two items. I only buy packaged nuts grown in the US (at Costco), though I buy pumpkin and flax seeds from the bulk seed and grain stores. I honestly have never thought to disinfect them, and we eat them raw regularly without any problem. Sorry I can’t be more helpful on those two items. Thank you for your help. We can buy seeds and nuts at a couple of local stores, but they are much cheaper at the market, so I will probably just risk it! What is the ration of GSE to water if you want to use it as a rinse for raw fooods in Mexico? Thank you for being helpful. I will check Sam’s when I run out of the Microdyn. I’ve been looking over some of your recipes. They sound so delicious. Have you ever come across a recipe for Guayaba pie? Thank you for the address of the website. I will look into it. I did make a guava pie once a long time ago following a recipe for fresh pineapple pie. I also mashed the seeds in a strainer to be able to use the flavorful stuff around the seeds. It turned out well. I have looked from time to time for a recipe, but only came up with guava cake and a sort of guava tort or pastry. Incidentally I believe they were both recipes from Tampa, Florida, Ybor City a Cuban community near where I grew up. They use to have Guavaween on Halloween. I am not exactly sure what all it involved. Thank you again for your helpful website, Cooking in Mexico. You are welcome, Angie. I’m glad you still visit Cooking in Mexico and I hope you still make some of the recipes. Let me know how that guava pie turns out! This may be a dumb question, but I wondered how long would the pan of Microdyn water for soaking stay good. For instance, if something happened and I had to leave my veggies(NOT in the water) and did not get back to them for hours or maybe the next day, could the water still be used if it still looks clean? I know my unsoaked veggies would be wilted. Thank you for your thorough answer. That is a help. On a different subject; I am looking forward to when you “perfect” your chocolate walnut spread. Unless you have already and I missed the recipe. I have recently perfected my recipe for Walnutella. You can see it here. Go to the second recipe, titled New Walnutella. I had asked you before about Microdyn. I started out using bleach to disinfect my fruits and vegetables. I recently switched to Microdyn in the bigger bottle, so supposedly it is not as concentrated as the smaller bottles. My husband just bought a small supposedly more concentrated bottle across the street. I soak my vegetables in 10 liters of water. According to the bottle I just bought it is 8 drops per litter of water. That ends up being 80 drops ! That seems like a lot. I do buy a lot of fruits and vegetables at a time. I agree, Angie. Eighty drops is a lot, especially when you squeeze each drop out one at a time while counting. But it is important to follow the instructions on each specific size of bottle. You are using a lot of water — I use 2-4 liters, and then re-use the same water until all the produce has been soaked. In the future, to make it easier for yourself, buy the big bottle of Microdyn that gives the measurements by the capful. Right now, I am using a liter bottle of Bactericida, and it calls for one capful (7 ml.) to 2 liters of water. I think that price-wise, you do better buying the larger bottle of Microdyn or Bactericida, anyway. I agree. Where do you buy the Bactericida ? I’d like to look into that. I bought it at Sam’s, and have also seen it at our local Mega Comercial supermarket. Microdyn will work just as well. It seems that the bigger the supermarket, the greater the chance of their stocking large containers, instead of the little bottles. I have been living in Mexico for fifteen years and have always used bleach for disinfecting my fruits and vegetables until recently. We have never had a problem. My husband and I contracted roundworms. I believe it was from lettuce (salad) from a local Roticeria that did not clean the lettuce properly. The owner changes employees quite often. Anyway the doctor told my husband soaking the vegetables in Cloro would not be enough, because it would not kill the eggs. She told us to use Microdyn. After using it and finding it did not kill a little green caterpillar on the cauliflower, it makes me wonder. I am a germ freak and wash and scrub my vegetables first. Then I put them in a soapy solution that supposedly takes off a lot of the pesticides and more dirt if I missed any. Then they are put into the clorox/water solution to soak for twenty minutes. After reading some of the posts especially #2. I will now always rinse my fruits and Veggies after soaking them in bleach. I still wonder if it is safe in the long run? I found your site while looking for information on Microdyn. It seemed you had to use an awful lot of the stuff. My husband did buy the big bottles though. Next time we will look for the concentrated stuff. Do you disinfect your countertops, faucet, sink and any brushes etc. you may have used in the disinfecting process? What do you use? I have been using bleach and water in a spray bottle to disinfect those things mentioned plus things I bring in from the store. I wipe down everything I bring into the house. People hardly wash their hands here and no telling what they’ve handled during the day or where things may have been sat that may have contaminated these things. After reading that second comment I am a little concerned about using bleach so much. I see this article is two years old. Are you still in Mexico? I wondered because of all of the trouble lately. If you are still here, in which state do you live? You may not want to answer that. Also, what do you do about eggs? I mainly use brown eggs from the grocery store, but white or brown, a lot of times they still have feathers and chicken do do on them. I would rather clean then all at once and put them in the frig. I rub, rinse and soak them too, but maybe that is not the best method. I read somewhere eggs are porous and should not be soaked. Maybe the ten minute Microdyn soak would be okay or a shorter soak in a more concentrated recipe. I have also been putting a little chlorine in my rinse water for doing dishes. I read on a sign not long after we moved here telling people to boil their water for twenty minutes because of the danger of contracting cholera. So I put some clorox in my rinse water. Maybe I should check more into peroxide. If I understand your question, you are asking if rinsing off the cloro solution is safe in the long run. While I am not an authority, I would say yes. The veggies are fine to eat once they are rinsed of cloro residue. I buy a big bottle of concentrate Mycrodyn, and it lasts a long time. I do not disinfect counter tops, etc. I wipe everything down with hot, soapy water when I fill up the sink to wash dishes. Once a month or so, I clean my counter top with a bleach solution, but that is to bleach out the stains from the grout between the counter top tiles. Yes, I still live in Mexico. We live in the southern part of the state of Nayarit, on the Bay of Banderas. Our area is a very popular tourist destination and is relatively free of violence. Many of us expats who live here regret how the U.S. media has depicted the violence as though it is all over the country. It is in specific areas, and there are many parts of Mexico that are safe. I feel as safe here where I live as I do when I visit my family in the States. I do not rinse off eggs, unless they are obviously dirty. We buy eggs mostly from a supermarket that packages very clean eggs. Washing eggs removes a coating on the eggshell that is naturally on the shell to keep the egg from drying out. If you wash your eggs, do it right before you use them. Perhaps you live in a rural area that does not have clean water. Our town water is already treated with chlorine, which I regret because I don’t like to shower in it or wash my hair in it, but I have no choice. If your dishes are completely dry when you put them away, there is no reason to use bleach in your rinse water, unless you feel that the tap water is contaminated. I don’t know the situation where you live, but my understanding is that drinking water should be boiled for 20 minutes if there is a cholera risk. As we buy bottled drinking water, there is no need to boil it. Basically, my food preparations include a Microdyn soak, with no special dishwashing procedure, beyond making sure the dishes are completely dry. My husband and I stay healthy, but it is up to each individual to make their own decisions regarding food and kitchen sanitation. I also recommend that you talk to your neighbors about the water situation. They should be able to tell you if the tap water poses any risks. Please write again if you have anymore questions — I’m glad to answer as best as I can. Thank you so much for that really clear and precise information (which is rather precious, here in Mexico). I’ve recently moved to the Puebla state and will stay here for several months. I’ve just been through a food poisoning so I’m terribly cautious at the moment. I had no idea that you have to soak fresh fruits and vegetables here! After reading your article I ran to Bodega to buy Microdyn. So from now on I’ll follow your advice to the letter! Is there anything else (in terms of hygiene) that I should be aware of (in the kitchen but also anywhere else) that’s not commonly done in the US/Europe??? I would really appreciate some guidance as everything seems so… alien at the moment… Thank you! The only other things I would recommend is to buy bottled water — don’t ever drink water from a tap. And when you eat out, make sure your food is well cooked and served hot. I have sent food back before, asking that it be brought to me very hot. We usually don’t eat raw salsas in restaurants. You can tell by the appearance if a salsa is raw or cooked. As to whether you eat salads or other raw food in a restaurant is your call. Hopefully, you can converse with the staff and find out how they cleaned the produce. Keep your mouth closed in the shower. Don’t swallow any water. And rinse your toothbrush in bottled water, not tap water. Puebla has wonderful mole and beautiful ceramic ware. Try new foods in the markets — there are so many different things, like homemade chocolate for making hot chocolate drinks and fruits and vegetables you may have never seen before, to discover. I’m sure you will enjoy your stay there. I’ve heard a lot about moles but haven’t had the chance to try them so far. I will need to buy a “food guide” as I don’t recognize many of the fruits I see in the market. But they look delicious – and so do the dishes you show on your blog. I will definitely try them out (although my “estufa” is veeery small). Thank you once more! Try every new thing you see in the market, Nikki, and you will make some great discoveries. Diana Kennedy’s My Mexican Kitchen — Techniques and Ingredients, is very informative and covers most of the unusual fruits, vegetables and herbs (as well as the common ones), and gives directions on how to prepare them. I would have another question for you, if that’s all right. As I work very long hours, I don’t have much time to cook so I was thinking of buying some frozen vegetables to speed up the process. Could you tell me if they are safe to eat here? What brands are the best option? I would soak them in Microdyn before cooking, but I’m not sure if that will do… Thank you in advance! Nikki, I don’t buy frozen veggies (except for frozen peas), so I can’t recommend a brand (I don’t remember what brand of peas I buy, as I don’t purchase them very often). I would say that they are safe to eat without soaking. They have already had some processing, which would include cleaning. I never soak frozen peas in a cleaning solution, but rather add them directly to fried rice or soups. I love the aroma of guava! I like having a few in the fruit bowl just for the fragrance they add to the room. I also like them in fruit salads. I hope you try papaya, another favorite of ours, and something we eat almost every week. I have only used grapefruit seed extract that was commercially prepared for cleaning produce; I bought it at Walmart. Note: grapefruit seed extract, not grape seed extract. I found this recipe on ehow. Pour into a spray bottle. After removing soil debris from fruits and vegetables, spray with grapefruit seed mixture. Allow spray to set for 10 minutes. Rinse off with clean water.Dry produce before storing in refrigerator to minimize spoilage. Do not use on mushrooms or strawberries, as they will absorb the bitter grapefruit seed taste. Thanks for the detailed info about disinfecting produce. Now, what about washing dishes? The latest dish detergent we got in Mx says it is antibacterial, but I don’t know what that actually means. Is a disinfectant rinse necessary if dishes are washed thoroughly? Lee, I have lived in Mexico almost 14 years, and I have never known of anyone to use a disinfectant rinse, nor are people I know concerned about antibacterial dish soap. Your query prompted me to check my dish soap label (Kirkland, Costco’s house brand). It makes no claims of being antibacterial. My opinion is that a disinfectant rinse is not necessary. What is important is to use hot water, soap, and rinse well. Then let the dishes either air-dry or dry thoroughly with a towel. I live in Canada and Canadians think that rinsing your fruits and vegetables with tap water is good enough to clean them well. I am from Mexico and my friends used make fun of me because I disinfect my fruits and veggies. Then they changed their mind when we had an outbreak of salmonella and tomatoes and broccoli were removed from the super-markets and Restaurants. If people would’ve had the habit of disinfecting their food, nobody would’ve gotten sick. Now my friends follow my example. Tap water will rinse off soil, but it can’t kill bacteria. In some areas, tap water is probably sufficient, but with contaminated food becoming more common, it is good to be extra careful when cleaning produce, especially if it is eaten raw. Thank you so much! I am looking forward to the recipes. I have never heard of mole de novia. I have the recipes, there’s 2. One made with Pulque (mezcal) and the other one made with white wine. Where can I send them to you? I sent you an email with my address. I’m really looking forward to seeing them. Thank you so much. Fab website Kathleen! We’re about to embark on our yearly trip to PV where our fave place on earth to eat is Bucerias. I have only in 6 years gotten sick at a touristy place in Old PV (which is no longer there). We also find it fine to sip on tap water in PV as it’s purified. I’m glad you like Cooking in Mexico. 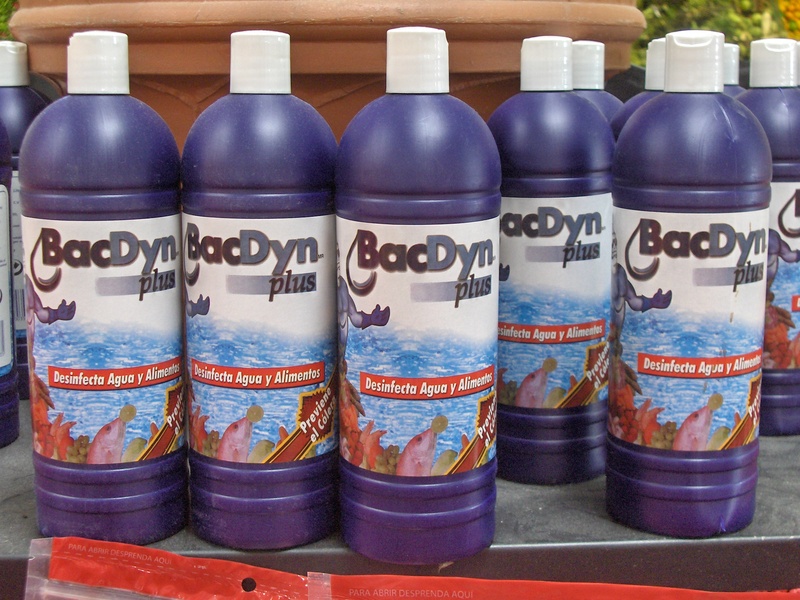 To answer your questions: if you use Microdyn or Bacdyn (or a similar product) it does not have to be rinsed off. It is safe to ingest. If you use Chlorox, then yes, you do need to rinse it off. say it should be rinsed. Of course, it is fine to ingest vinegar. Since I don’t use it for cleaning produce, I don’t know if a taste remains or not. Enjoy your vacation to Mexico, and please visit Cooking in Mexico again. This information has been extremely helfpful, and I am sharing it with friends and relatives. I appreciate your posting it and the amount of detail included. You are welcome. I’m glad you found it helpful and can use this information. This is an excellent post. A couple of years ago, two people died in California, due to spinach that comes clean in bags. Supermarkets took the spinach out for three months, until Health Dep. discovered it was for manure bacteria, from a neighbor´s farm. You see, even it looks perfectly clean, it could be also dangerous. I have read of using lime juice to clean produce in Mexico, but its use is not widespread, and I don’t know how reliable it is. Being acidic, it hopefully would help clean, but I haven’t come across any studies on this method. In Mexico, fresh meat and fish are not treated with disinfectant, but are cooked well. I hope you can take an antibacterial product with you on your trip. I am guessing that there is much that is not available in Haiti, given their dire circumstances since the earthquake, so it is best to take your own. Surely a bleach like Chlorox would be available there, and it is always a reliable disinfectant. When it doubt, don’t eat raw produce and treat your water if you can’t purchase purified water. I’m glad you found this article helpful and I hope you visit Cooking in Mexico again. Have a good trip — maybe you are going to Haiti to lend assistance. Eating organic fruits and vegetables will remove any possibility of pesticide exposure. Whether one eats organic or not, fresh produce should still be carefully cleaned in Mexico. the small amount of bleach used to wash the veggies and fruits poses no risk to the septic system and in fact, bleach breaks down over time any way. Using the soak solution you referenced was pioneered by a Hazel Parcells, who was both a chemist and a natural doctor. Hazel lived to be over 100 and she soaked all her fresh produce. Sean, thank you for this additional info. I will look up Purcells and read about her research. Thank you for this information. We are fleeing the all inclusive vacations and going to Bucerias this December & January, and your info here is great. Thank you. I look forward to cooking and eating in Bucerias. Thanks for visiting. I’m glad you find the info here helpful. You’ll find lots of good eating opportunities in this part of Mexico. Very interesting ! We (in US) use 3 drops of non-scented chlorine bleach in a gallon for a 20 minute soak and then soak/rinse in clear water 20 minutes. We have pristine well water so are comfortable with the soak/rinse not causing a problem. This makes all veggies crisp and long lasting. I think I read this method on a US army site. But what do you think we might be doing to our septic system? I’d estimate we do 3-5 veggie/fruit washings per week. Thanks in advance for any insights you might have. I honestly don’t know if this small amount of chlorine bleach would affect a septic system, which needs bacterial action to function correctly. In recent years chlorine has come under attack from many environmentalists, and rightly so. Particularly dangerous are compounds called organochlorines, which are generally toxic and persistent in the environment. To my knowledge, few household cleaners sold after 1995 contain organochlorines as ingredients. Many household cleaners do contain chlorine bleach. Chlorine bleach, or sodium hypochlorite, is not an organochlorine. It is hazardous, however, because it is reactive and a lung and eye irritant. Products containing chlorine bleach usually contain trace amounts of organochlorines that cause cancer in animals and are expected to do so in humans. Small amounts of organochlorines are also formed whenever chlorine bleach is used, although most of the bleach does break down into salt water. So, should you give up your chlorine bleach? Not necessarily, but responsible use of bleach means minimal use. Other types of bleach are available that are a bit less hazardous, but none of them can be used to disinfect. … It makes sense to avoid cleaning products with chlorine bleach in them. They make it hard to limit your chlorine use. Disinfection, if needed, can be done separately. We use well water as well and have a separate ‘leach’ line for gray water which is from sinks, showers and laundry. But before we changed the system over to the two part system, it all went into one and we had no problem with bleach in it. Your observations about bleach in the gray water agree with Sean’s comment below saying that the small amount of bleach used for cleaning produce should not result in problems for a septic system. Until we find scientific research backing this up, personal experience is just as good (if not better) an indication that this cleaning procedure causes no problems for septic systems. Here in Chile the chlorine I buy (which is 4.9% sodium chloride or 5 gl / lt) says add 1 ml per 10 liters water and soak for 5 minutes. Chileans wash lettuce in regular water. I tell them that is a waste of time unless you use chlorine. There would be less risk of salmonella and other food poisoning in produce grown nowhere near any poultry, pig, or cattle operations or downstream of that. Read this article in The New Yorker. You will never eat under cooked food again. Thanks for the NYT link, Walker. Also thanks for your chlorine proportions. I’m sure this will help others. Chlorine (commercially available as Clorox) is very effective in cleaning produce.